The TP3 tool bag is a clip-on diagnostics bag which holds a meter and a variety of tools. It clips onto any model Veto tool bag’s tape clip or D-Rings. The TP3 tool bag is a clip-on diagnostics bag designed to hold a meter and a variety of tools. When not in use it can clip onto any model Veto tool bag’s tape clip or D-Rings. It features 15 pockets of various sizes that will accommodate the most commonly used tools to diagnose and repair problems on service calls. Bought this along with the MB bag to compliment my Tech LC. Strong little tool pouch that can carry a surprising amount of smaller tools, ideal for quick fault finding/ service jobs, without carrying the bigger bags about. Also handy when working up ladders etc. very secure belt hook that also fixes easily onto Tech LC. I received this product free with the purchase of a Tech XL tool bag, is a very nice addition to the bag. Excellent bags from an excellent company! Purchased this to use as a grab bag and it works great for diagnostics and trouble shooting. You can fit most of the tools in it you need to make most repairs. I own the Tech LC and use the TP3 as a everyday carry bag for maintenance work/troubleshooting around a 300,000 SQFT property. It fits what I need and if I need more than that. I get the cart and the Tech LC bag. The TP3 is very easy to overload because it has so many pockets. Belt clip is very strong but IMO is only good for a quick ladder climb or storage on Tech LC bag. I wish it came with a shoulder strap. I use my strap from the Tech LC for this. Works really nice. Not perfect but it works. I really like the way I can quickly remove this bag from my Tech XL, and have it clipped to my belt. With my old tool pouch, I wasn’t able to carry a DMM with me, but with the TP3, now I always have one with me. They only thing I would change, would be to have a tape measure clip on it. A tape measure clip, would also be nice on the TP4. just put in a few essential tools and it makes a great little diagnostic bag !!! perfect for trouble shooting calls, working above ceilings and in crawlspaces. take the tools you need for the job at hand. My company installs packaging machinery so we use a lot of wrenches, levels and other hand tools. We also have to carry around nuts, bolts and washers. The TP3 is one of the better belt carries. I like the simple clip that lets me quickly remove it. It also has a nice belt loop. The compartments hold there shape and allow for easy access to everything stored in the belt. This is an awesome addition to my veto pro pac arsenal. I own 3 veto pro pac bags so far and this one definitely didn’t disappoint! I either clip it on my belt or to one of my other bags depending on the repair I have to make. As an HVACR mechanic I need to have fast access and be able to see all my tools. Must be organized and everything has to have its place. With veto I can do just that. Keeps me organized and tough enough to withstand daily abuse on the job. My search for new tool bags is over now that I’ve owned a pro pac. Never will I purchase another brand again! Thanks Veto for your outstanding products! I purchased this in conjunction with the Laptop XLT. When I simply do not need many tools but also do not want the pockets of my coveralls full of tools, I decided this was a good option. Before buying this I was losing tools which fell out of my pockets while climbing stairs or kneeling. Most of the time I heard something fall, but occasionally a tool fell through a grating and was much more difficult to reach. I also found that although I designated specific pockets for specific tools that I would always put the tool into the wrong pocket. When I needed the tool again I had to search all of my pockets because I could not remember what I had actually done with the tool. The TP3 allows me to keep the tools out of my pockets, keeps them all visible, and as long as I can hang the TP3 nearby then all of my tools are within reach. One note: Mine came with two handles, but no tape holder. I am not sure why, but I do not need the tape holder. With the tools out of my pockets, I can keep the tape in my pocket. I went to this bag because the bag I have needed to be replaced often. I lost tools and always had issues with pocket size. I really like my new bag allot. Everything is organized and in view. Very happy customer. This is by far the best small tool pouch that I have had. I have 4-5 other bags from other companies and they all had pros and cons. The TP3 had no cons for me. It hold tools securely has plenty of room for a small bag. good quality, not too heavy but will stand on its own when set beside you. nice handle for carrying when not used on your belt. 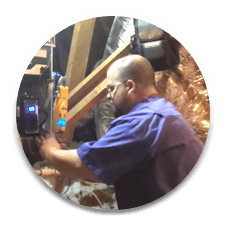 I do residential hvac installations and do on call every few weeks. I had all my hand tools stuffed in a bag and every time I was on call makeup a second smaller bag for that purpose. The downside being every time I needed my meter, wire strippers, flashlight, etc…during the day I would be running to the van to get my on call bag or a certain tool. A few weeks ago I bit the bullet and bought the veto lc. Loved it the first day I used it. But again the same issue when on call, dividing my tools just to have to pull out the on call bag time and time again during the day. Now this past week i was on call again and recieved the tp3 in the mail as part of the promotion. This bag is perfect. I have my multimeter, nutdrivers, and other basic service tools that I use occasionally on installations in the tp3. By clipping the tp3 to my lc I can bring the majority of my hand tools in during the day and already have a service bag on hand for on call. A lot of people in the building trades. Hvac, carpenters, electricians, etc. Tend to spend money on quality tools but over look the tool bags, which now I realize is just as important. This is my “first assault” tool pouch. I carry the basics for troubleshooting or minor adjustments/repairs. If the job requires more, I go back to the truck for my OT XXL. When it’s time for ladder work I just pack what I need in my TP3 and put it on my belt. Bought the Tech-XL and received the TP3 for free. This is a great little tool pouch. With my parts cart and the TP3, installing pipe and trim-out its great. It holds quite a bit for its size. Put what you need in it for the task and go. Makes for a lighter and more compact set up. Thats a good thing when up and down ladders and crawl spaces all day. For instance when running 3/4″ & 1″ EMT. I hold 1 or 2 pairs of Channel Locks, three nut drivers, torpedo level, straight screw driver, reamer screw driver, 3/8″ and 7/16″ small ratchet wrenches, sammy driver, a few impact driver bites and a Sharpie. You could fit a few more things but then I would just wear my full set of bags. Even less when doing trim work. If your not needing full tool bags and use your back pants pockets, this would be for you. This is a perfect size pouch for what I need. Not to big and not to small. It would be nice if Veto made a TP4 version size parts pouch for screws, straps, fittings, etc. This would be perfect set up for tight spaces. Stop wasting money on cheap bags. This is the best bag i have owned in my 24 years of being a commercial hvac service tech. has lots of space and easy to handle. Couldn’t ask for anything more. shipping was great and fast. No issues at all! Packing was great and we’ll cared for. No defects or issues. I have now use this for over a month in the field with my tech backpack and I must say it is very nice to have something smaller and portable for those “quick fixes” or smaller jobs. The quality is amazing and it definitely shows. All the stitching is done very well, and the fabric is a very tough material. I have 0 complaints with my product and highly recommend it to anyone. I bought the Tech XL. When registering I seen the T3 Pro and just had to have one. It is fan tastic when climbing up ladders and roof hatch ladders. Every tech knows what a pain it is getting tools up the ladder. No more ripped pockets snagging channel locks and screw drivers on ladder roof hatch guards. It makes it much safer and less time consuming when trouble shooting system in bad places. They always put our equipment in tight places. Oh yes my truck seats have holes from control screw drivers left in my back pocket, not any more. Was doing a huge install the beginning of the summer and needed an open top bag to hold my small tools . I bought this one and its perfect . Only thing missing was a shoulder strap. Quick fix was taking the one off my Tech- LC and i’m off and running all day . Hands down the best brand of bags made! I am an HVAC technician and like most people, I am always buying news tools to help make my job easier. I started out with the Pro Pac and added the MB2 shortly after. I thought my collection was complete, until I saw the TP3 and a supply house. I was hesitant to buy it at first but I decided to give it a try and am glad I did. I still use my Pro Pac for major installs, my MB2 for service, where the TP3 helps is on those simple jobs that you know exactly what tools you need. I try to have separate tools for installs and service, so having the TP3 there to quickly grab with just a basic set of hand tools is nice. I would of however chosen the TP4 over the TP3, if it was in stock. Overall I am happy with this bag and am sure another Veto bag will eventually make it’s way into my company van in the future, since my tool collection constantly grows. This truly is a must have it holds more tools than expected and truly compliments other bags I have the tec pac and I just clip it on the side for storage and clip it off right onto my belt when needed. The added hadle at the top it much more useful than you would expect. Veto you rock! When recieving this tp3 pouch, will the label say Tech Series like the picture shows or HVAC Tech Series? I bought the tp3 its my 3rd veto bag since i found this brand i will never buy anything thing else, even if it means that i have to wait to save the money to get what i want. This TP 3 is the best pouch I have ever owned in the 30 years that I have been a electrician. I’ve tried many different brands none of them can stand up to this little pouch. It is very well made you can see that they paid a lot of attention to details. Everything on it is heavy duty and the extra protection where you insert your screwdrivers is a nice touch. HVAC service tech here, and this is my second veto bag after the tech pac I purchased first. I wanted a small bag for quick diagnostics and small repairs. This was it I’ve had this bag for 2 years it still looking good with minimal signs of wear.